Among Cahn’s champions is Dave Kehr, a curator at the Museum of Modern Art, who has programmed a four-week series (running through Wednesday, June 15) devoted to his tenure at the studio, Universal Pictures: Restorations and Rediscoveries, 1928-1936. The rarity-packed lineup highlights one of Junior Laemmle’s greatest virtues as a producer: his willingness to grant uncommon creative freedom to directors who were distinctive and inventive stylists, including Fejos, James Whale, John Stahl, and William Wyler. Among this heavily European stable of directors was the American-born novice Edward L. Cahn, represented by three shockingly grim and startlingly good films. They form a kind of unholy triptych, three variations on the bottomless theme of American corruption and violence..
You might say he worked his way to the bottom. If Edward L. Cahn is remembered at all, it is as a maestro of Poverty Row, a director who churned out the kind of B movies whose titles exemplify truth in advertising: Invasion of the Saucer Men, Riot in a Juvenile Prison, Motorcycle Gang, Zombies of Mora Tau, Guns, Girls and Gangsters. You might say he worked his way to the bottom. The Brooklyn-born Cahn had a precocious and promising start: he went to work for Universal Pictures in 1917 while still studying at UCLA, and within a decade was editing some of the studio’s most artistically daring films. He cut Paul Leni’s lyrical, bizarre silent melodrama The Man Who Laughs (1928), and Paul Fejos’s dazzling early talkie musical Broadway (1929), a film literally built around a massive camera crane that offers soaring, swooping views and dizzying montages of an art deco nightclub the size of an airplane hangar. Cahn also worked on last-minute changes to All Quiet on the Western Front (1930) just before he made the jump to directing. A high-water mark for Universal, All Quiet, which won an Academy Award for Best Picture, was not produced by Carl Laemmle, the studio’s founder – though he happily claimed the Oscar – but by his son, Carl Jr. He was known as Junior Laemmle, a condescending nickname he resented, but which is now used with affection by his champions, who point out that Junior was a far more ambitious and adventurous producer than his father. Among these champions is Dave Kehr, a curator at the Museum of Modern Art, who has programmed a four-week series devoted to his tenure at the studio, Universal Pictures: Restorations and Rediscoveries, 1928-1936. 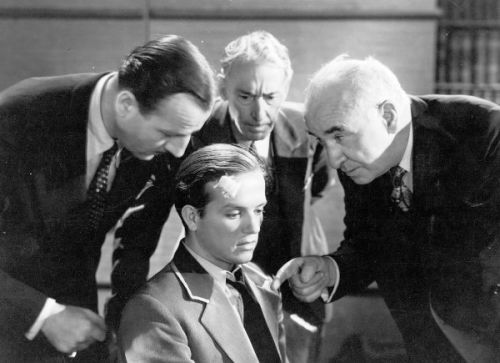 The rarity-packed lineup highlights one of Junior Laemmle’s greatest virtues as a producer: his willingness to grant uncommon creative freedom to directors who were distinctive and inventive stylists, including Fejos, James Whale, John Stahl, and William Wyler. Among this heavily European stable of directors was the American-born novice Edward L. Cahn, represented by three shockingly grim and startlingly good films. They form a kind of unholy triptych, three variations on the bottomless theme of American corruption and violence. Cahn’s experience as an editor shows in his second film, Law and Order (1932), a gritty, noirish take on the Wyatt Earp story. (The editor on this film was Cahn’s brother Philip.) Though the action is confined to a town, with many scenes of men talking in rooms and crowded bars, Cahn gives kinetic excitement even to small actions, as when the camera follows a tray of whiskey shots being carried around a barroom, elegantly introducing the major characters. Long, swift tracking shots follow men as they lope along the Main Street, passing crowds and horses and storefronts. Crowds mill and rush; a political rally and a would-be lynch mob do not look choreographed, but realistically chaotic and unpredictable. The climactic gunfight at the O.K. Corral is brilliantly cinematic and viscerally brutal, though not a drop of blood is spattered. Rapid, staccato cutting; explosive shots and falling bodies; panicked horses rearing and plunging, all in the semi-darkness of a cluttered barn, convey pulse-racing confusion rather than graceful ritual. This scene, and the entire film, is far more honest than many westerns about the waste and bitterness of settling things with guns. In some ways Law and Order looks forward to revisionist westerns of the 1960s that portrayed the West as a grubby and unheroic place. The atmosphere is flavored with casual but pungent details: the way men arriving at a hotel check the mattress for bugs, and their grooming ritual of lightly dabbing a little water on their dust-streaked faces, then using spit to smooth down their hair. As in a Hawks film, the characters are built with trademark details and mannerisms – one man sports a showy silk scarf, another a vest shredded to cobwebs (the latter is a youngish, uncredited Walter Brennan, as a saloon menial who sits around polishing spittoons). Walter Huston plays the Wyatt Earp character, here called Frame Johnson, with a mix of affable tut-tutting and ferocious authority. John Huston, a friend of Cahn’s, worked on the script, adapted from a novel by W. R. Burnett. 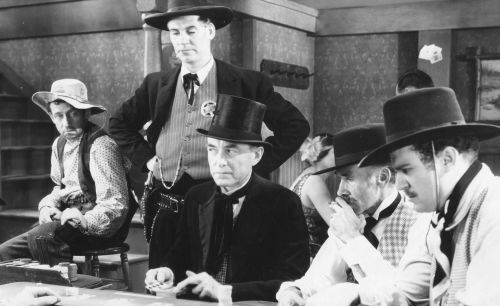 But the standout performance is by Harry Carey as Brandt, a top-hatted, shotgun-toting gambler who is Johnson’s best friend. Unlike Doc Holliday in most versions of the Earp legend, Brandt is not a rival or a friendly enemy but a raffish counterpart to the upstanding peace officer with a disturbing tendency to fly into trigger-happy rages. When Johnson deputizes him, he jovially slings his shotgun over his shoulder, thinking he has been given carte blanche to kill anyone he chooses. Yet Brandt is irresistibly charismatic, largely thanks to Carey’s deep, resonant voice, wry smile, and understated grace – it’s easy to see why the actor was such a touchstone for John Ford and John Wayne. When Johnson and his friends ride into Tombstone, it is like any city in the grip of gangsters, a whirl of bright lights, gambling wheels, blazing guns, and hoochie-coochie dancers. They arrive in the midst of an election night conducted like a semi-controlled riot, with townspeople strong-armed into re-electing a blatantly corrupt sheriff. 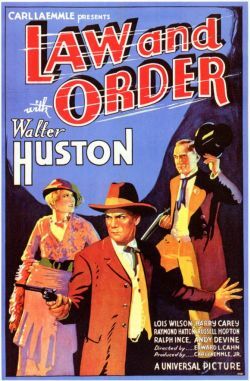 But Law and Order is not incidentally a western, nor just another version of the town-tamer saga: it is an unusually ambivalent and challenging treatment of the central western theme of imposing civilization and decency on a lawless frontier. The complex tone is most fully revealed in an episode when Johnson saves a killer (a boyish Andy Devine) from a lynch mob so that he can have a proper trial. The boy is sentenced to hang and dissolves into tears, but Johnson tells him to buck up, offers him a cigar, and says, “Do you realize you’re the first man to be hung legal in Tombstone?” The kid brightens up, proud of this distinction and relishing the attention. The public hanging has a carnival atmosphere, with vendors hawking candy, which the prisoner munches happily on the gallows. A brass band plays a jaunty, up-tempo rendition of “Shall We Gather at the River?” – the hymn that Ford uses in the church-raising scene from My Darling Clementine (1946), his own treatment of the Gunfight at the O.K. Corral. This echo makes Cahn’s earlier film feel almost like an irreverent riposte to Ford’s reverent, ceremonious vision of a community taking root. But the hanging scene in Law and Order is not merely black comedy or caustic satire. It is also moving and sad and unsettling: a rapid sequence of close-ups shows men and women (the first is a black man) watching the body fall, solemn, anxious, upset. And when the judge afterwards comments, “Everything went off all right,” Johnson casts an eloquent look offscreen at the dangling corpse. Not for him it didn’t. In the end, with most of the characters dead, Johnson bitterly concludes that people “don’t want peace,” and rides off in the beautifully bleak dawn light. The same year, Cahn made Afraid to Talk (aka Merry-Go-Round), which might be called an exposé of civic corruption except that it takes for granted the general knowledge that everyone in power is corrupt. It still has the power to shock, however, as it follows the misfortunes of a bellboy who has the bad luck to be in the room when a racketeer is bumped off, and the worse luck to be a convenient fall guy when the party bosses need to convict someone, but can’t touch the real culprit because he is blackmailing them with their colossal malfeasance. The bellboy, Eddie Martin, is played by Eric Linden, the kind of fresh-faced male ingenue who’s always saying, “Gee, that’s swell!” – though Linden’s honking New York accent and hint of toughness keep him from cloying. In the film’s most harrowing scene, Eddie finds himself in a windowless room encircled by a pack of menacing cops prepared to beat a false confession out of him. One reaches up and shoves the hanging lamp so the naked bulb swings back and forth, round and round, making shadows of men lunge and shudder on the walls and hot light pulse on the hapless innocent’s pale, nervous forehead. The great cinematographer Karl Freund (Metropolis, The Last Laugh) may not have invented the swinging lamp effect here, but he exhibits near total mastery of noir lighting in this film, almost a decade before the noir cycle would begin. Eddie is beaten to a pulp offscreen: we hear it going on while watching a couple of the men taking a break from pounding the kid, washing their hands like Pilate and complaining that their coffee is cold. When one of the more squeamish thugs (they turn out not to be real cops) expresses discomfort at what they’ve done, the others sneer at him: “Are you turning pansy on us?” and dismiss his guilt with a shrugging “It’s all in the game.” While Eddie’s fate is cruel, the film is anything but glum. It’s full of wild parties, drunken women in evening gowns dancing on table-tops, and fractured, swirling montages of speakeasy life. The big boss doesn’t just have a bar behind a swiveling bookcase: when he pushes a button, a panel slides out of the wall and there’s a bartender standing behind it, already shaking a cocktail. (Does the man live in this cubbyhole? In 1932, presumably, people would do anything for a job.) And in the film’s most memorable image, a racketeer played by Edward Arnold, at a party celebrating his release from jail, draws aside a curtain to reveal the floor of a nightclub. A line of chorus girls enters dressed as chain-gang prisoners, deliriously conflating two iconic images of the Depression era: I Am a Fugitive from a Floor Show. Afraid to Talk is gleeful in its boundless cynicism, almost sadistic in the way it dwells on men of power smirking and chortling as they torment their powerless pawns. As the crooked D.A., Louis Calhern is all patrician sleaze and hypocritical sentiment; repellently unctuous, he can scarcely contain his delight in his own rotten cleverness. 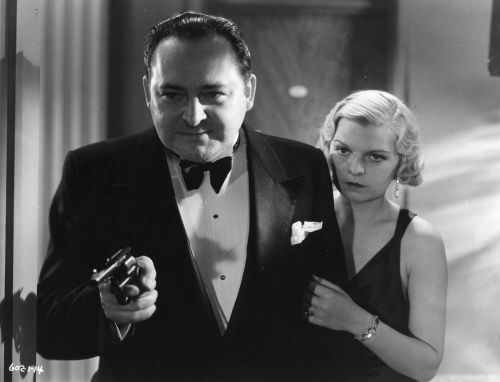 Edward Arnold, who by alternately playing tycoons and gangsters revealed them to be all but indistinguishable, keeps grinning and chuckling at his invincibility, looking not so much like the cat that swallowed the canary as like a grizzly bear that’s just eaten a whole boy scout troop. 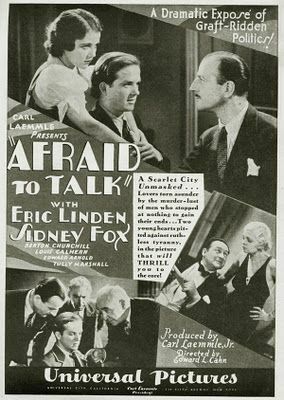 While Afraid to Talk can be called proto-noir, it lacks certain key noir elements. Throughout the film, people are divided between the virtuously innocent and the shamelessly vile; there are no shades of grey. Nor is there any interiority or concern with psychology. This is typical of pre-Code movies, made in the depths of the Depression. In these films it’s as though people are so consumed by the fight to survive, or by the determination to forget their worries, that they have no time for private emotions. Society itself is so anxious, so hysterical, so compulsively bitter, that it takes the place of individual psyches. Everyone is part of one big nervous breakdown. A recurring narrative device in Afraid to Talk has plot points literally spelled out on a news ticker scrolling around the face of an art deco skyscraper. We see the crowds commenting on each turn of events: construction workers digging up the streets, hookers strolling through the crowds, newsboys brandishing headlines, rich snobs in taxicabs. We see the smarmy mayor’s re-election parade, complete with brass bands and flaming torches (shades of Law and Order), and the camera zeroes in on the bums toting placards extolling the mayor’s virtues. “I’m just doing this for a feed,” one says. Another (Walter Brennan again) sighs, “It’s a hell of a long walk for one feed.” In the film’s opening moments, a group of men cradling cups of coffee in a breadline talk about the times. Things can’t go on this way. “It’s comin’, I tell ya, it’s comin’!” one insists ominously. Though the movie tacks on a happier ending than the Albert Maltz-George Sklar play on which it was based, it leaves no doubt that nothing is really going to change. The bartender in the cubbyhole isn’t going to have to look for a new job. Cahn managed to go even further in his next film, Laughter in Hell (1933). Indeed, he may have gone too far: Dave Kehr speculates that this raw, savage film ended his career at Universal.1 No one seems to know exactly why he left the studio; John Huston described running into him in England in 1934, where Cahn was stranded after the fly-by-night company that had hired him folded. According to Huston’s colorful account, he and Eddie were reduced to singing cowboy songs in the streets for spare change, before they wangled a job on a race-car picture called Death Drives Through, earning enough for passage home. When Cahn returned it was not to Laemmle’s studio, but to Monogram on Poverty Row. Over the next three decades, he turned out shorts at MGM, most notably in the “Crime Does Not Pay” series (he also toiled on Little Rascals shorts, a troubling thought), and went on to work at many Poverty Row studios (the longest stints at American International Pictures and with producer Robert E. Kent), shooting pictures in a week with minuscule budgets, admired by some for his speed and competence and dismissed by many as a hack and a has-been. He became, in Jake Hinkson’s words, “the consummate Poverty Row professional.”2 Laughter in Hell, which feels rougher than Law and Order or Afraid to Talk, shows he already had the skills that would enable him to work quick and dirty and still pack a punch. 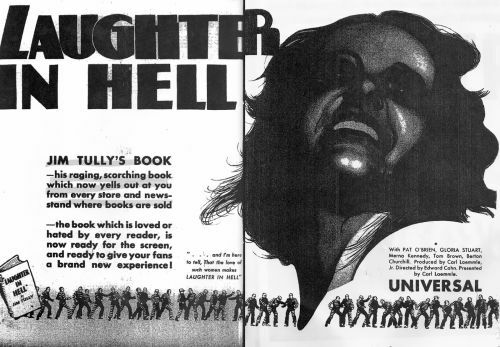 Based on a book by legendary hobo author Jim Tully (best known for his autobiographical Beggars of Life), Laughter in Hell plunges us into a world that from the start feels jagged and extreme. The opening scenes lurch from a harsh glimpse of kids toiling in a quarry to a sentimental scene of a widower talking to his wife’s grave. The setting is the South, playing its familiar role as the American id, archaic and infused with hate. Pat O’Brien, sporting his best Irish brogue, plays an amiable fellow named Barney Slaney who works on the railroad. He falls in love with an overripe New Orleans belle (Merna Kennedy), who marries him but guiltlessly carries on an affair with his lifelong arch enemy, breaking away from adulterous clinches to wave at her unsuspecting husband as he goes by in his locomotive. (The railroad connection suggests a debt to Zola’s Le Bête Humaine.) When Barney catches the lovers, he goes ape and kills them both; the camerawork in this scene makes us feel complicit in the murder. He’s sentenced to a life at hard labor, on a prison farm that makes the one in I Am a Fugitive from a Chain Gang look like a four-star hotel. As if that weren’t enough, it’s run by the brother of the man Barney killed. The prisoners are housed – to use too kind a word – in cages on wheels, packed into rows of bunks like animals in a particularly inhumane traveling zoo. 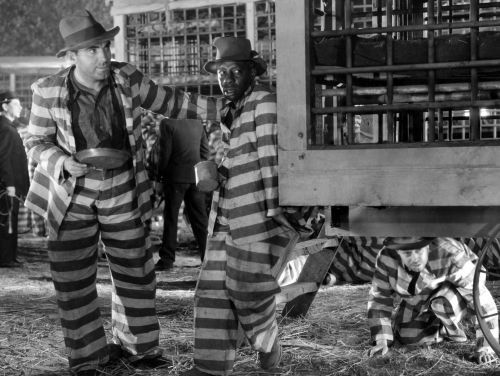 The chain gang is Depression era cinema’s deepest and darkest vision of people bound together by suffering, as well as the ultimate symbol of exploited labor. Perhaps movies like this were a kind of reverse escapism for 1933 audiences: anyone’s life would look good in comparison. When Barney arrives at the camp, four black inmates are due to be hanged. The other men are griping that the hymns, shouts, and prayers of the condemned men have been keeping them up at night. Indeed, their delirious terror and desperate spiritual exaltation make the scene explosive and unnerving. And just when you expect the camera to turn aside tastefully to look at shadows or dangling feet, it doesn’t. Like the prisoners brought out to witness the execution, we’re forced to watch the men swinging from a branch. Even more jaw-dropping is the aftermath, when the other black prisoners fall to their knees to pray over the dead men and the guards try to force them back, while the white prisoners speak up, growling, “Ah, let ’em pray.” “Yeah, it’s their religion.” Nothing in Universal’s horror cycle is as horrifying or queasily riveting as this scene. The film’s racial dynamics are striking. Black actor Clarence Muse plays a coolly philosophical, circumspect prisoner who hangs out with Barney and another white cell-mate who reads Schopenhauer on his bunk. When they are all shipped off to dig graves in a town ravaged by yellow fever, Muse remarks with solemn irony that he doesn’t care for the work: “There’s no future in it.” Moments later, a young prisoner played by Tom Brown – like Linden, a fresh-faced kid-brother type – reaches the breaking point and collapses in shrieking hysteria, which seems a reasonable response under the circumstances. The prisoners take this as a cue to riot and kill their hated overseer. Note: Unless otherwise indicated, all images courtesy of the Museum of Modern Art.